Karina's Kreations: Awash With Flowers using Paper scraps! Awash With Flowers using Paper scraps! 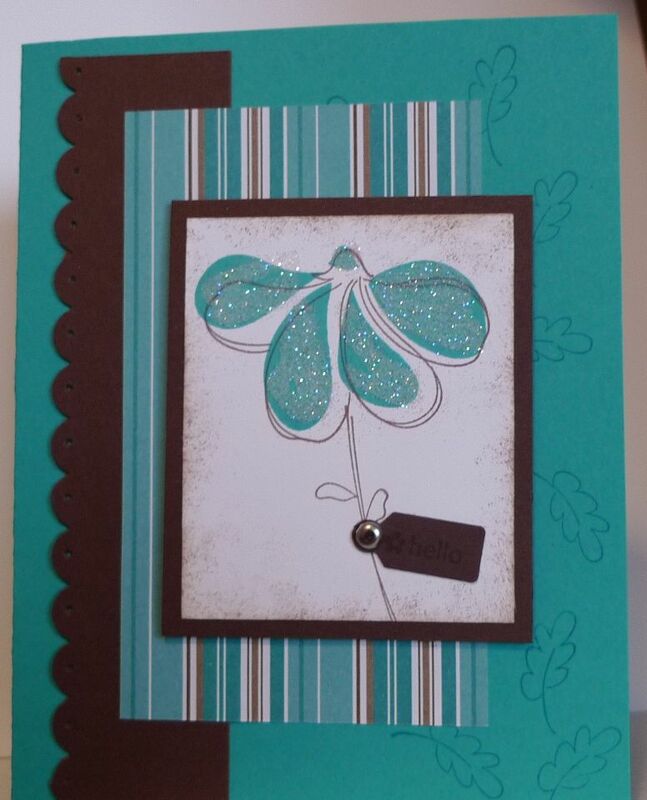 This card was inspired by using a paper scrap from Throughly Modern Designer Paper. I'm running a card class on Monday and have lots of these little pieces left over. My card base is Bermuda Bay and I stamped leaves from the Awash with Flowers stamp set in Bermuda Bay ink. I added some Chocolate Chip card stock to the left side of the card after scalloping one edge with the Scallop Edge punch and paper piercing each scallop with the Mat Pack and paper-piercing tool. The flower was stamped with Chocolate Chip ink on Whisper White card stock. The center was filled in with Bermuda Bay ink and the matching solid flower image stamp. I added Dazzling Diamonds glitter with a two-way glue pen. The Greeting was stamped in Chocolate Chip ink on Chocolate Chip card stock and punched out the the Medium Jewelry Tag Punch. The stamp set is called Tiny Tags and is too cute!!! I attached it to the card with a silver brad. The designer paper is Throughly Modern.